Two things there are never enough of: hours in the day - and counter space in the kitchen. Sorry waffle iron, ice cream machine and panini press, you guys are banned to the back of the cabinet shelf until I have use for you. My Vitamix, Nespresso, juicer and humble toaster own permanent spots. Lucky plug-ins. So when I crave a freshly grilled panini - I have to lug out my shiny, wide-bodied press. Not really fair when you take a look at what this simple machine (just plug and press!) can do to a few slices of bread and some sandwich toppings. 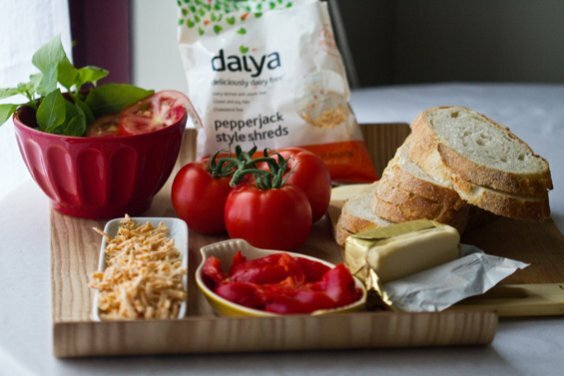 Sometimes I will add just a few shreds of Daiya cheese (or even skip it altogether) and other times I'll pretty much empty however much is currently left in the bag (vegan cheese bonanza) - a downpour of silky vegan cheese shreds over top my Earth Balance slathered bread. Splurge. 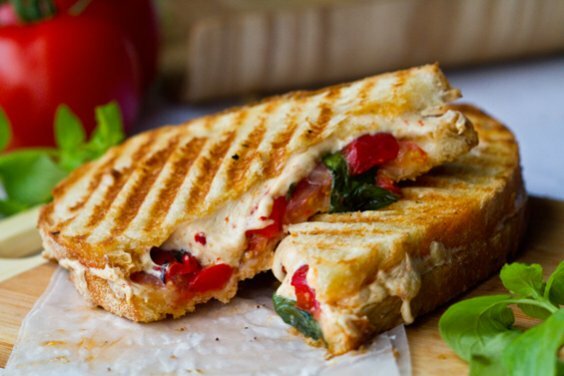 But besides the grilled cheese euphoria that occurs based on my many childhood memories of the dish - I mostly love this panini for the combination of aromatic flavors - sweet basil, bold and juicy red roasted bell peppers - the kind you have to pry out of a jar and slice into thin shiny ribbons - bright tomato swimming with garden-fresh seeds, plenty of fine black pepper - maybe some harissa for extra spiciness - and sometimes some spinach stuffed in there too. 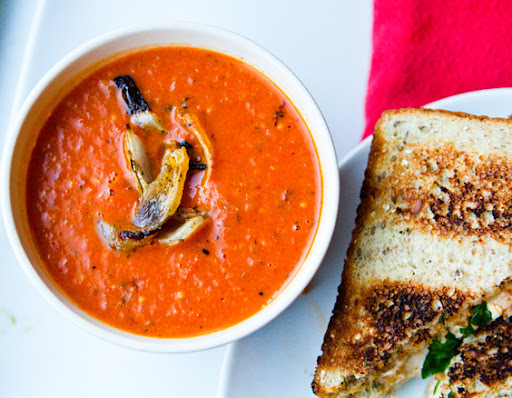 Pair this panini with a warm bowl of tomato or veggie soup for a meal to cheer up any average or gloomy day... 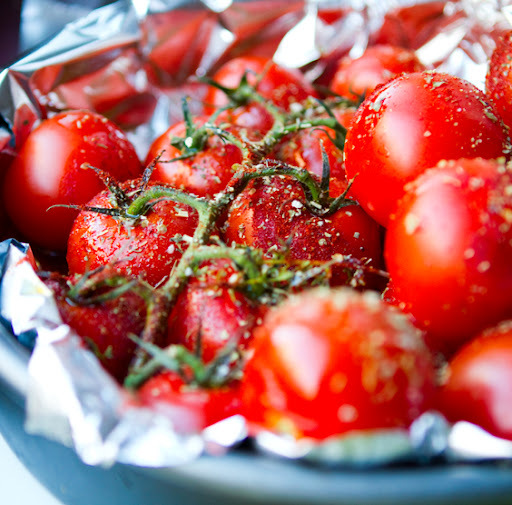 Recipe for my roasted tomato soup.. 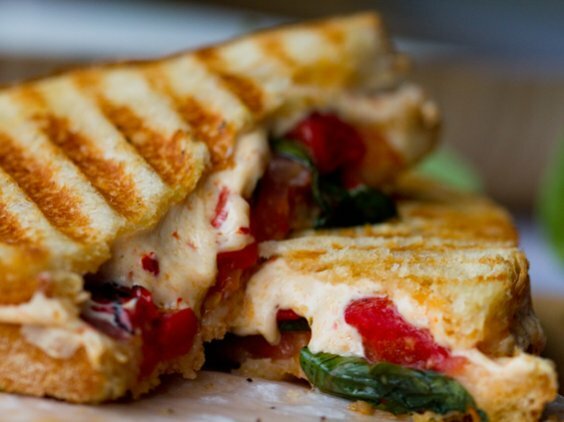 This melty bliss vegan grilled cheese sandwich pairs aromatic basil with pepperjack Daiya and lively red tomatoes. Slather the vegan buttery spread on the outside sides of the bread. 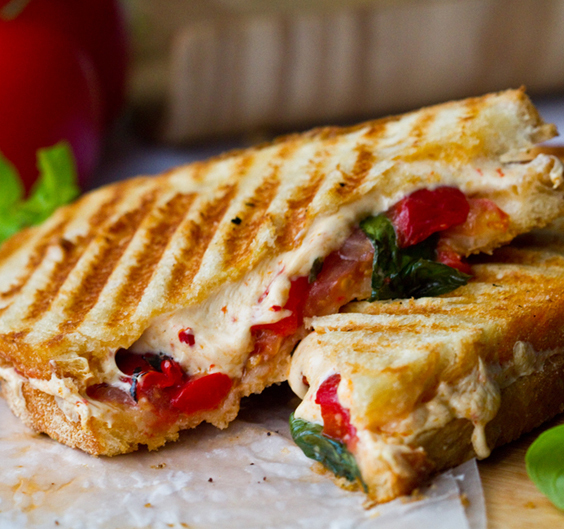 Warm up your panini press while you prep your veggies. Place one slice of bread, vegan butter side down on the panini. Add all the toppings and top with the other slice of bread, vegan butter side up.